Lit. Large pagoda. A 2-storied pagoda. A large pagoda of the *tahoutou 多宝塔 type, with a square lower story with an attached pent roof *mokoshi 裳階, a cylindrical upper section and pyramidal roof. The only three daitou exant are those at Negoroji 根来寺 (1492-1547) in Wakayama prefecture, Kongoubuji Saitou (west pagoda), 金剛峯寺西塔 (1834) in Wakayama prefecture and Kirihatadera 切播寺 (1618), Tokushima prefecture. Daitou are distinguished from ordinary tahoutou only by being 5×5 bays instead of the usual 3×3 bays. The pagoda at Negoroji is 30.85m high. The interior of the pagoda has twelve pillars *suirinbashira 水輪柱, also called *naijinbashira 内陣柱, that circle the core of the building *moya 母屋, and are connected by rainbow beams *kouryou 虹梁. The core has four very heavy pillars *shitenbashira 四天柱, which have the largest diameter of all the pillars in the building. 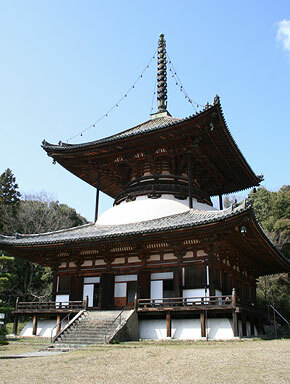 The pagoda has steps which are centered on each side of the structure and lead to the Buddhist alter *butsudan 仏壇. The interior of the Negoroji Daitou is considered to best represent the true daitou style. 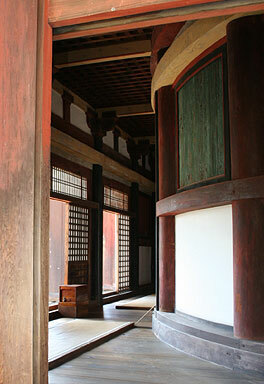 Daitou as well as tahoutou were considered to be important buildings among the seven main halls in the Shingon 真言 sect. The Daitou at Kirihatadera was originally located at Sumiyoshi Taisha Jinguuji 住吉大社神宮寺 and moved to its present site during the Meiji period. It is thought to be unique because it has a square upper story instead of the typical, cylindrical, white plastered type that curves at the top above the pent roof. It is 5-bays square (10m ) on the lower story and 3 bays square on the upper one. All its pillars are circular. The bracket complexes are 4-stepped　*yotesaki tokyou 四手先斗きょう. This pagoda differs from the tahoutou plan in that the pillars are arranged in a concentric square instead of the typical circular arrangement. This is the only surviving completely square, 2-storied daitou.